Paul McCartney’s One On One tour’s July 5th U.S. opener at Miami’s AmericanAirlines Arena has been re-scheduled to FRIDAY, July 7th to accommodate enhancements to the tour’s production. Tickets for the original July 5th date will be honored for the July 7th performance. Those unable to attend the re-scheduled date will be able to receive refunds at their original point of purchase. We apologize for any inconvenience caused, but sincerely hope that everyone will be able to attend the show and enjoy an amazing evening. Following Paul’s first Miami appearance since his Up & Coming Tour hit Sun Life Stadium in 2010, One On One heads northwest to Tampa, where Paul will play July 10th at the Amalie Arena, returning to the city for the first time since his 2005 US Tour. From there, the tour plays July 13th at the Infinity Energy Arena in Duluth GA, July 15th at CenturyLink Center in Bossier City LA, July 17th at the Chesapeake Energy Center in Oklahoma City OK, and July 19th at the INTRUST Bank Arena in Wichita KS. On July 21st Paul plays the Wells Fargo Arena in Des Moines IA followed by a July 23rd stop at CenturyLink Center in Omaha NE, returning to both cities for the first time since 2005’s US Tour. The tour’s July run now concludes with two nights July 25th and 26th at the Hollywood Casino Amphitheatre, Tinley Park in Tinley Park IL—Paul’s first appearances in the region since his now-legendary 2015 Lollapalooza headline. One On One’s 2017 U.S. run will resume with Paul’s first ever shows at the Prudential Center in Newark NJ on September 11th and 12th. Paul will then take up residence in New York City, playing his first full shows at Madison Square Garden since 2005 on September 15th and 17th, then getting back to the scene of his unforgettable 2013 Brooklyn shows to play the Barclays Center on September 19th and 21st. Paul will then head upstate to make his debut appearance in Syracuse NY, playing the Carrier Dome on September 23rd, followed on September 26th and 27th by Paul’s first shows at Long Island’s NYCB Live’s Nassau Veterans Memorial Coliseum since 2002’s Driving USA Tour. 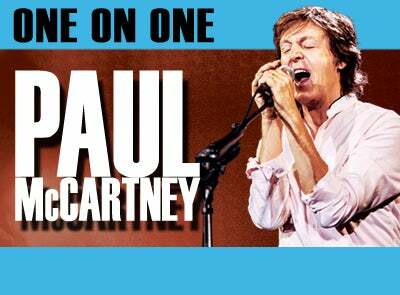 One On One’s fall dates will draw to a close October 1st and 2nd at Detroit’s Little Caesars Arena, Paul’s first shows at the brand new venue and first visit to the Motor City since 2015. Paul McCartney’s One On One tour opened April 13, 2016 with Paul’s debut concert in Fresno CA. The show, which opened with Paul’s first performance of “A Hard Day’s Night” since The Beatles last played it 1965, drew instant and unanimous raves from near (“McCartney’s abundance of natural charm and charisma made this sold-out arena show feel and more like a really big piano bar”—The Fresno Bee) and far (“nearly three hours of music that moved gracefully from the intimate to the explosive… the emphasis never drifted from the music, ranging from generational anthems to post-Beatles deep cuts”—Rolling Stone). One On One has since logged 36 shows and counting, spanning the globe from North and South America to the UK and Europe and a current run of Japanese dates. Venues have ranged from packed stadiums and arenas to one of the most intimate gigs of Paul’s solo career to date at the 300-capacity Pappy & Harriet’s Pioneertown Palace in tiny Pioneertown, CA. One On One’s 2016 run wrapped up with two headlining sets at the historic Desert Trip festival in Indio, CA, which featured surprise guest appearances from Neil Young and Rihanna—a fitting coda to a tour that featured Paul joined on encores by the likes of Nirvana’s Krist Novoselic in Seattle, Jimmy Fallon in Vancouver, and both Bob Weirof the Grateful Dead and New England Patriots tight end Rob Gronkowski at a record-breaking show at Boston’s Fenway Park. The Paul McCartney live experience is everything any music lover could ever want from a rock show—and so much more: Nearly three hours worth of the greatest moments from the last 50 years of music, dozens of songs that have formed the soundtracks of our lives. Paul and his band have played an unparalleled range of venues and locations: outside the Coliseum in Rome, Moscow’s Red Square, Buckingham Palace, The White House, a free show in Mexico for over 400,000 people, the last ever show at San Francisco’s Candlestick Park where The Beatles played their final concert 1966, and even one performance broadcast live into Space! Featuring Paul’s band of the last 10+ years – Paul “Wix” Wickens (keyboards), Brian Ray(bass/guitar), Rusty Anderson(guitar) and Abe Laboriel Jr (drums) – the show is never anything short of life-changing. Check http://paulmccartney.com/ for more information.